The cyclist described as the “politest man in the peloton” is hoping to force his way to the front of the queue and grab himself a place at one of this season’s Grand Tours. 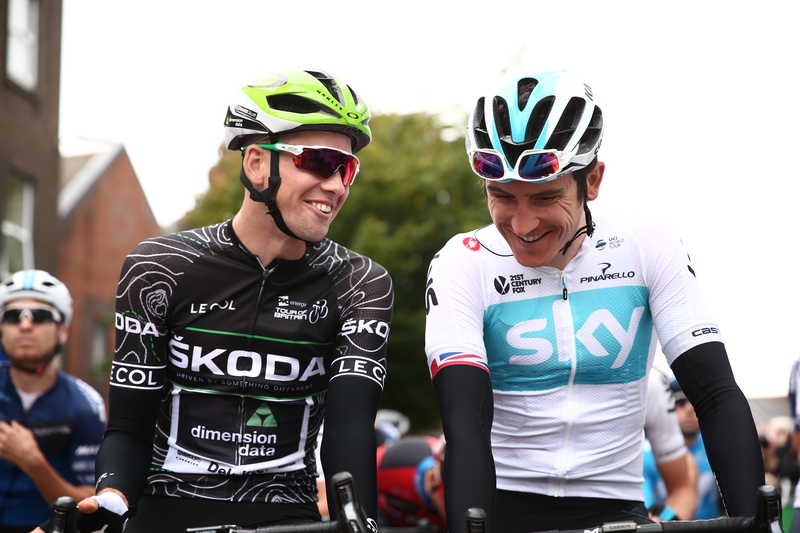 Carmarthen’s Scott Davies, who was the top British rider at last year’s Tour of Britain, outlined his ambitions in a disarmingly honest interview for his Dimension Data team. The engaging 23-year-old talked openly about the difficulties of making the transition to the World Tour circuit, the emergence and success of Welsh cycling, the sacrifices needed to reach the top and his gratitude towards his parents for giving him the opportunity to follow his dreams. His immediate ambition is to impress at next week’s Presidential Cycling Tour of Turkey and secure a place on one of cycling’s showpiece stage races – next month’s Giro d’Italia. Looking a little further ahead, he says: “Obviously my medium term goal is to get renewed or get another contract. My long term goals depend on that really. In a wide ranging interview, Davies heaped praise on the Welsh Cycling system which has seen so many of his countrymen and women currently shining on the world stage, led of course by Tour De France winner Geraint Thomas. Asked about Wales’ recent cycling successes, Davies said: “I think it just goes to show how hard Welsh Cycling works to develop riders. “It’s only a small federation in the grand scheme of things but to think of what they’ve got to hand, they make the best of it and do a really good job. “I think anyone who has been involved in Welsh cycling would probably say that Darren Tudor, the head coach, has helped them at some point in their career. The former Ysgol Bro Myrddin pupil started cycling at the age of 11 when he used to go out on his bike with his dad, but he soon joined his local Towy Riders Cycle Club in Carmarthen. Then came the decision to join Madison Genesis rather than go to university. After a year at the British Cycling Academy he competed for two years with Team Wiggins before last year joining World Tour team Dimension Data. Known as Africa’s team, Dimension Data has a strong relationship with Qhubeka Charity, which helps change people’s lives in Africa through cycling. The South Africa-based team aim to fund thousands of bicycles every year for the charity. The team roster includes the likes of former UCI World Champion and serial Tour De France stage winner Mark Cavendish. Davies admits he found last year’s transition to World Tour standard difficult: “I think the step up is even harder than I had anticipated. Scott Davies competed for Team Wiggins before making the switch to World Tour level. “I had been warned it is a massive step but I think until you experience it first hand nothing really does it justice so definitely a really tough year for me last year. Some nice highs but a lot of lows as well. Davies admits he is still finding his feet at the highest level, but feels he is making progress. “It’s not that I’m settled in by any means, but I’m getting there slowly. “Obviously physically it’s a huge jump. I thought the under-23 scene was tough, but it’s not a patch on this to be honest. “Also, psychologically it’s a lot more race days, that takes its toll after a while. I think as well, readjusting your mind from being competitive and trying to win under-23 races to then just trying to survive a World Tour race, that’s pretty tough actually. It’s not as easy as it may seem. “Naturally your confidence takes a hit when you turn up and you’re bottom of the pile again, but it’s all part of the journey, so from just speaking to some of the older guys on this team they all look back at their neo-pro years as some of the toughest in their careers. Davies says his parents have played a big part in helping him make the switch to World Tour standard by offering support after difficult days in the saddle. “My parents are probably the first port of call, they know me the best at the end of the day, so it’s really good to keep things in perspective and have a chat with them,” says Davies. Davies also acknowledges the role played by his parents in allowing helping him achieve his cycling ambitions to date. “If it wasn’t for my mum and dad taking me to national series races when I was a junior up and down the country, spending a small fortune, then I wouldn’t be in the position I am today. Davies says thinking about the sacrifices his parents made acts as an extra incentive during demanding days. Davies also feels making that the move to live in Nice in the South of France when he was 20 helped his progression in the sport, although he has since decided to base himself back in the UK. “I was 20 when I first moved here (Nice), I’d never been here before and just took the plunge,” says Davies. “In all fairness I met a lot of good riders, a lot of good pros down here who helped me a lot and that was really beneficial to see how they do things and just to get to know some of those guys. “I was in a really fortunate position because not many people get the chance to do it. It was really important to help me grow up a little bit I suppose to move away from home and mum and dad and all the rest of it. “Obviously it was really tough at times because I never really embraced French, which didn’t help me, but I’ve met some really good people, made some great friends down here and I think I look back at my time in Nice with fond memories. Davies says the most difficult thing about being a cyclist is the sacrifices riders must make to be successful in the sport. “It’s a bit of cliché and you hear it all of the time, but now that I’ve seen it with my own eyes, it does take a hell of a lot of sacrifices if you really want to be good. On the subject of him being reputedly one of the nicest personalities on the circuit, Davies is asked if he is indeed “too nice”? “No comment on that one,” he replies before continuing. “I don’t know. Maybe. Maybe in the races, yes, but no, I don’t think you can be too nice off the bike. “Obviously I think everyone changes a bit when they pin their number on and get on the start line. I’m not as nice on the bike as I am off it maybe. “I think once you get on the start line you have a totally different approach to it and you switch your mind-set a little bit. At the age of 23, Davies is asked where he would like to be when he is 46. “Who knows, it depends, how good this season goes. “I’d love to be in a position where I can look back and say I did 10-15 years as a professional cyclist and I achieved all my long term goals and to be in a position where I am proud and I have no regrets.